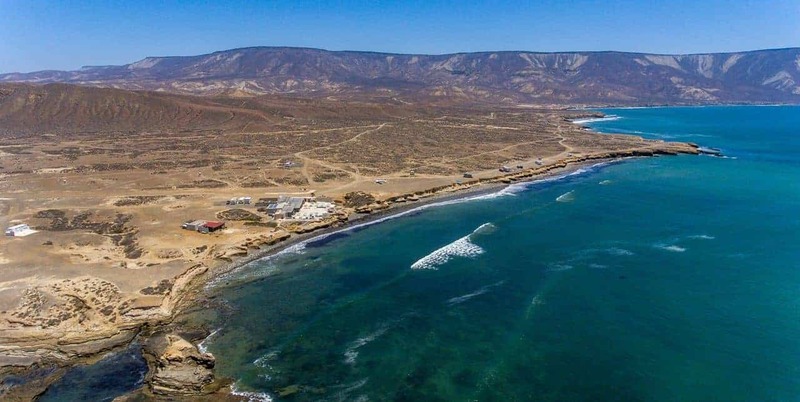 Punta San Carlos was found by the pioneer windsurfers back in the early 80’s and has been popular within the surfing and windsurfing brotherhood for nearly 40 years now. You go there to ride the waves. This spot is most famous for its long rolling waves and reliable steady cross offshore winds all year round. When we’re talking “the best kitesurfing destinations in the world”, Punta San Carlos has definitely a lot going for it and for that reason takes a proud spot on this list. Punta San Carlos lays in the North part of Baja California on the Pacific Ocean. The nearest local town still accessible by the road is El Rosario, About 450 kilometres away south of the US. The kitespot itself is only accessible by the bumpy drive on the dirt road, so you’ll need a 4x4 to reach this destination. The next big city after the US border is either Tijuana or Ensenada. You can take a flight to Tijuana from wherever you are in the world or take the shuttle bus from San Diego to Ensenada, that will take about 3 hours, there are many options available for this part of your journey. Hire a good 4x4 and drive down to El Rosario town. From here continue on the Highway 1 for another about 20 minutes or so until you see a turn to the dirt track on your right. There is a camping resort set up in Punta San Carlos for the Solo Sports guests only. The only camping resort in the area. The camp has been established all the way back in 1987 offering all-in-one experience, all inclusive watersports holidays. If you are staying in the Solo Sports camp, don’t worry about a thing, but otherwise make sure you stock up on food, water, petrol, firewood and have a good tent and comfy sleeping bag as it could get pretty chili at night. You’re on your own, everything is BYO, you won’t find any luxuries there, not even a dunny. Flying over the coast will convince you that Punta San Carlos is practically in the middle of nowhere, as there is nothing for many kilometres around it. If you are an adventurer and go places to get away from the crowds, this may be just the perfect kitesurfing holiday you’ll be talking to your grandkids about. There is no nightlife, no resorts, no phone or internet, literally nothing around apart from desert wilderness. It’s an awesome spot for eco tourism. When it blows, it’s nuts! Punta San Carlos offers perfect kitesurfing conditions all year round, but It is best to come for the kitesurfing season that starts from February and goes until late November. The thermal wind is pretty strong and consistent at this time of the year, particularly in the months of spring. From March to October, it’s 20-25 days a month blowing over 20 knots. From March to May the wind could be reaching anywhere from 25 to 40 knots and from June to August it blows an average speed of 25-35 knots. From September to November, it eases down a little to about 18 to 25 knots. The wind is usually lighter in the morning, creating awesome conditions for surfing and stand-up paddle. It becomes stronger in the afternoon and continues to blow through the night. Its consistency is just incredible. The best waves come during spring months, but even throughout the summer, this place offers great fun for surfers. Most of the waves here come from ground-swells, these are medium sized waves reaching from 1 to about 3 metres. The ideal swell angle comes from the south-west. Beachbreak - Beachbreak offers the easier, slowly rolling waves. It’s perfect for learning to ride the waves as these are slowly peeling right hand point breaks that are significantly smaller here than on the other spots. In the low tide, there are a few hazards to watch out for, rocks and reef, so you might want to consider wearing booties. The Point - This kitespot picks up big swells and offers much more powerful and rippable waves here. Some say the best right hand point break for kitesurfing in the world! This spot doesn’t have a beach, it’s just rocks and a cliff, so if it goes wrong, you may find yourself in a bit of a pickle. Not recommended for the beginners. The Chilli Bowl - about a hundred metres pass The Point is The Chilli Bowl. This spot gives a real chill even to the pro riders. From here the waves just keep on rolling down for another mile or so. Enjoy the ride, but don’t get taken too far down, otherwise it could be a pretty long upwinder to get back. Bombora - This spot has some large and powerful waves. When the swell is pumping, this spot offers some awesome kickers for the sky high jumps. Make sure you come to Punta San Carlos well prepared for both cold and warm weather. It’s the desert after all and the temperatures can drop significantly in the evenings. The coldest months are March, April and May, with temperatures from 13 – 21 degrees Celsius in the day and 10 – 16 degrees at night. Water is around 13 – 16 degrees, so the full wetsuit is a pretty good idea. It starts warming up in June and July and water and air temperatures increase. August to October are the warmest months with water temperatures of about 20+ degrees Celsius. Not windy? No way Jose! The wind rarely stops in Punta San Carlos, but you can have a great stand-up paddle session every morning before it picks up. every morning. In case you want to take a break from water sports, you can try mountain biking. There are nearly 150 kilometres of trails around the Punta San Carlos area which are pretty popular among the world’s best pro riders. Take an awesome sightseeing trip as there are many cultural attractions around the area like petroglyphs, rock art, solstice sites or remains of the past inhabitants.